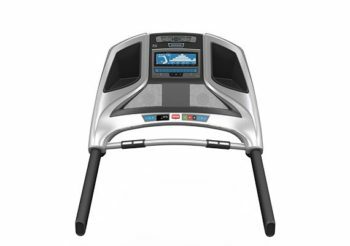 The Horizon Elite T5 Treadmill is On Sale! Horizon Fitness recently introduced the Elite T5 as a great entry-level option for those wanting the ability to exercise from home. With the high quality motor that we look for on all Horizon models, the 2.75 CHP motor in the Elite T5 is great for walkers or joggers, but may not be the right fit for those looking to really log the running miles. With an eye to take the place of the Adventure 5, the Elite T5 offers some impressive upgrades, including a larger motor, larger screen and more programs. These features make the Elite T5 a deal worth checking out at $1199. MID-WEEK SALE ENDS THURSDAY: The Horizon Elite T5 is ON SALE for $1,199 and they are throwing in FREE Shipping and their 100% Guarantee. 2.75 CHP Motor – With speeds up to 12mph, the motor in the Elite T5 is great for those that are looking to be able to push themselves. The motors for Horizon treadmills are built specifically by Johnson Fitness for each model. They are high-quality motors that utilize a larger magnet and run at lower RPMs, which result in the motor staying cooler and make less noise. Not only will you get a quiet workout session, but this motor constantly recalibrates to ensure that you always get the smoothest possible use. 15% Incline – The increase that we see in the incline vs. the Adventure 5 is perfect for those that want a little bit more challenge in their workout. Whether you are using this model for walking or jogging, that additional incline will really make a difference in the calories you are burning and the muscle tone you are building. ViaFit – You can use your ViaFit account to sync with your tablet or cellphone and wirelessly track all of your workout information. From calories burned to number of workouts per week, you can see yourself working hard and there’s no better motivation than that. You can also share your progress and goals through social media and integrate your stats with other fitness apps you may use. 20” x 55” Running Surface – The width of the Elite T5 running surface is roomy enough for most everyone, however the length may leave a bit to be desired. At 55” this may not be the best for taller runners or those with a long stride. 3-zone Variable Response Cushioning – Size aside, this running surface does offer some great features. The different zones of shock absorption in various areas are designed to give your foot exactly what it needs. You will receive more cushion towards the front of the belt where you land, making it easier on your joints. The back, where you are pushing off, will be more solid to help you with forward movement. It honestly is a very comfortable running surface which is more forgiving than the typical machine you’d find at a commercial gym. Featherlight Folding – The easy-to-use folding mechanism on the Elite T5 is great for those that are going to be hiding this model away for the extra space. The hydraulic system makes lifting and lowering the deck super easy. The system also makes for a slow, controlled descent when the machine is opened. This is a great safety feature to help avoid any accidents. A slowly descending machine will help protect and children, pets, or even your own toes while preparing for a workout. 8.5” Blue Backlit LCD Screen – The Elite T5’s screen shows you all the things you need to know during your workout. It tracks calories, heart rate, incline, speed, and time among others. It also uses a 400m racetrack visual to help you see your progress without counting numbers on the screen. 38 Pre-programmed Workouts – With this amount of workouts ready and waiting for you, you won’t ever feel like you’re doing the same thing every day. You can also create and save your own workouts if you want something a little more customized. 350 lb. User Weight Limit – This is a higher suggested weight limit than we usually see in treadmills in this price range. This makes the T5 an excellent option for larger users that are still wanting to get the health benefits of a treadmill. Safety Key – In the interest of safety, it is worth noting that the Elite T5 won’t turn on without the use of a magnetic safety key. 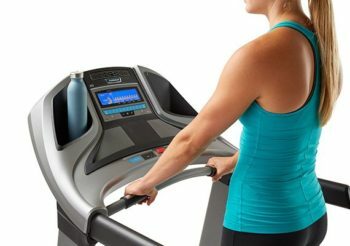 Without the key in place, the belt on the treadmill will not run which keeps everyone safe both on and off the machine. Keep the key hidden away when the machine is not in use so your kiddos don’t get into too much mischief. Warranty – Lifetime frame and motor, 3 year Parts and Cushioning, 1 year Labor. Johnson Fitness provides a strong warranty and excellent customer service. This company is a step above the competition when it comes to getting help with any mechanical problems. 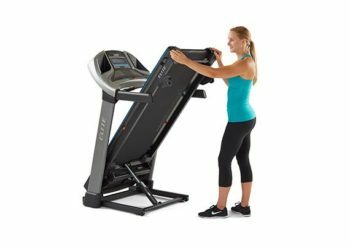 See a comparison chart of all Horizon treadmills here. The T5 is a great model for those that are looking to exercise from home without breaking the bank. 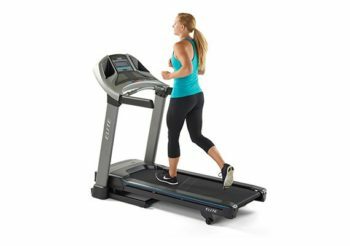 At $1199, this is a solid, durable entry-level treadmill that offers some excellent features to help keep you motivated and making progress with your fitness. The quality construction and motor will keep you moving and worry free. This is backed by Horizon’s lifetime warranty on both the frame and motor. If you are a serious runner, you may want to look at the Elite T7-02 or Elite T9-02 models which feature larger motors that may be better suited to logging heavy mileage. The 22” x 60” running surface on the Elite T7-02 and Elite T9-02 may also be something to look into if you are taller or have a longer stride and need some more space. The folding capability of the Elite T5 means this is an excellent option for those living in a smaller space or that want to keep the treadmill away from little ones. The safety key is also a great feature for anyone with children or pets in the house to prevent any accidents that can and do happen. With speeds up to 12 mph and an impressive 15% incline, the Elite T5 will definitely get your blood pumping and your muscles firing. While not designed to be a commercial quality machine, the Elite T5 is a fantastic option for those looking to reap the benefits a home treadmill has to offer. To learn more about the Horizon Elite T5, check out HorizonFitness.com.